Listen to any audio broadcast through your iPad speakers. Call in to participate through your phone. Broadcast video through either the front or back camera of your iPad. 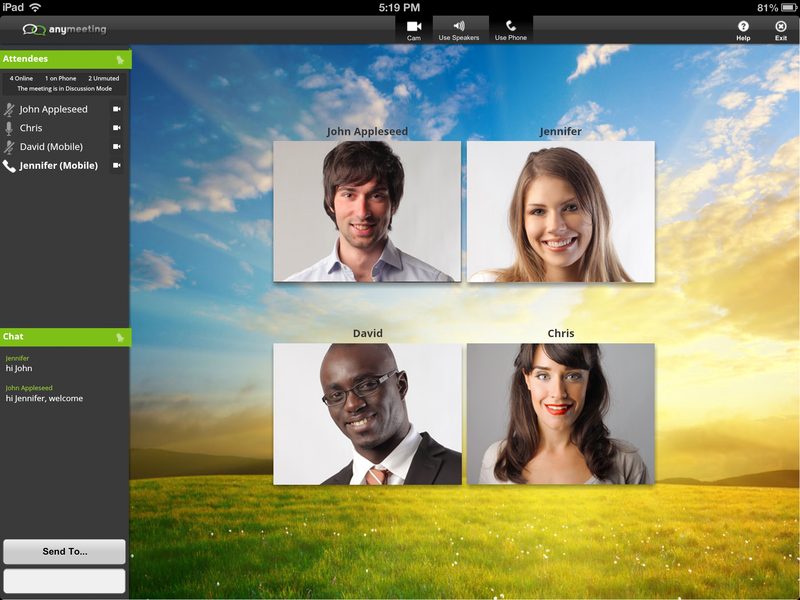 For complete instructions on using the new AnyMeeting iPad app visit our support site. I am excited to start using this App in our office. It’s a dream comes true. Great job on bringing that feature on board. Great news! Thank you for your hard work! Do you plan to add the ability to send audio via the app? Thanks Jason. Yes, iPhone and audio coming. Stay tuned for updates on timing! I don’t see a mention of this being available as an android app, is it available? Hi – yes Android is in the pipeline. Not available yet. Stay tuned! WOW! This is amazing, I am so impressed with the service offerings and new features popping up all the time!!! Any News on the iPhone app?